The history of the Beautiful Game has not always been so resplendent. Behind the glossy image of football lies a history of coercion, corruption and manipulation by three of the most powerful leaders of the 20th Century. For a country which has shouldered a weight of footballing shame in its time, it ranks as one of England's darkest moments in the sport. The venue: Berlin's Olympic Stadium; the date: 14 May 1938. 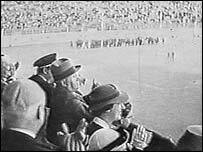 As the English players lined up alongside their German counterparts for pre-match ceremonies captain Eddie Hapgood and his men issued a Nazi salute to the crowd. The gesture provoked outrage in the British press, and was seen as all the more galling since Hitler was not even present at the time. But England's presence in Germany on that day was less about sport than politics. The policy of appeasement towards the Nazis pursued by Neville Chamberlain's government at the time had been intentionally transposed to the football pitch. It was a Foreign Office order that the England team, which included the legendary Stanley Matthews, perform the salute. The underlying message was calculated to be that Germany, which two months earlier had annexed Austria, was not a pariah state. The friendly game effectively helped clear the way for Chamberlain's "Peace in our Time" deal with Hitler, which, in turn, led to Germany's invasion of Czechoslovakia. 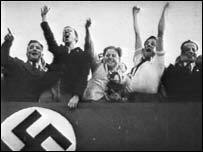 That England won the game 6-3, was something of a footnote, says Ulrich Linder, author of Strikers for Hitler. "To lose to England at the time was nothing unusual because basically everybody lost to [them] at the time. For Hitler the propaganda effect of that game was more important than anything else," says Mr Linder. While the Fuhrer's casting of the 1936 Berlin Olympics as a showcase for Nazism is well documented, the lesser known ties between fascism and football in the same era are highlighted in a new BBC documentary. Fascism and Football looks at how Europe's right-wing dictatorships pounced on the working man's sport as a means of drumming up support for their politics. Ironically, one thing Hitler, Mussolini in Italy and Franco in Spain all shared before reaching the top was an indifference to the sport. But their rise to power in the 20s was mirrored by football's ascent at the same time as an international sport. By the time of the first World Cup in 1930, football was recognised as a sport around which national identities could be moulded and manipulated. "Propaganda in football works because everybody can see that when I say I am the winner, it is true, I win," says Pierre Lanfranchi, of the European Institute of Sports History. First off the blocks was Mussolini, who colonised the game as a means of shoring up support for his fascist regime. He seized on Italy's hosting of the 1934 World Cup as a showcase for the re-birth of Italian power, drawing on the athletic imagery of the Roman Empire. But although Italy was a strong team at the time, its victory in the World Cup could not be assured. So it seems Mussolini, who dubbed himself Il Duce - the leader - set about fixing the tournament. At times, Italy appeared to have more sway than the official organiser, Fifa. Mussolini dictated which referees would oversee each match, and once on the field their behaviour immediately led to talk of corruption. The referees of two Italy matches were suspended by their home countries because of the poor standard of their officiating. In Italy's semi-final against Austria, the referee actually headed the ball to an Italian player. The same referee was drafted for the final and invited alone to meet Il Duce before the match. During the game the Italians' aggressive style of play went unpunished and the home team eventually won 2-1. Yet not everyone was corruptible. After Austria's annexation, Germany abolished the superior Austrian team and used its players to bolster its own side. But Austria's star player Matthias Sindelar refused to go along with the plan. 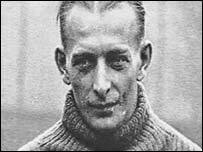 Not only that but in the two teams' final match before integration, Sindelar humiliated the Nazis by scoring one of two winning goals against Germany. Within a year, Sindelar was dead, aged 35. A Gestapo file marked him out as pro-Jewish and a social democrat. There has always been suspicion about the nature of his death - Sindelar, who had become a symbol of Austrian patriotism, died in his girlfriends' apartment from carbon monoxide poisoning. Some believed he had been killed, others assumed he committed suicide. His death was recorded as an "accident", but the reason for this has remained a mystery until now. Egon Ulbrich, a lifelong friend of the forward, revealed to the BBC documentary makers how a local official was bribed to record his death as an accident, thereby ensuring he would receive a state funeral. "According to the Nazi rules, a person who had been murdered or who has committed suicide cannot be given a grave of honour. So we had to do something to ensure that the criminal element involved in his death was removed," says Mr Ulbrich. Within a year, Europe's rivalries switched from the football field to the battlefield. Fascism and Football is on BBC Four on Tuesday, 23 September at 2030 BST.